Joining thousands of walkouts across the nation, around 2,500 of Palmetto’s students walked out at approximately 10:00 AM today to pay tribute to the 17 victims of the Marjory Stoneman Douglas High School shooting. The event idea was first brought to administration by senior Jarett Hyder. Palmetto joined thousands of schools nationwide holding walkouts to protest gun violence in schools on the one month anniversary of the MSD shooting. Hyder, along with a small group of students worked together with administration to plan the event. 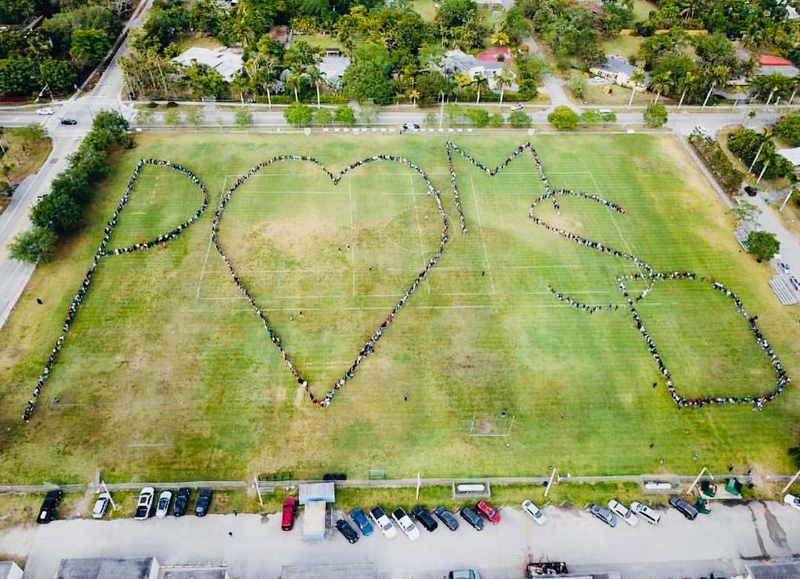 “The walkout, a couple of weeks ago, was a protest, I think this was Palmetto showing unity and sending their love to Marjory Stoneman Douglas. We wanted to show them that we care, we support them and we stand behind them throughout their journey,” one of the students who helped plan the event, freshman Nicole Markus, said. Dobbs described the idea as evolving until the abbreviations for “Palmetto loves MSD” was eventually settled on. Athletic Director Steve Batten not only spray painted the lines on the field showing students where to stand, but measured each letter and calculated how many students would stand in each area. Student protests across the country are far from over, as the March for Our Lives takes place on March 24 in Washington D.C., and another national protest is planned for April 20, the anniversary of the Columbine High School shooting.